Saving the universe from Dark Force since 1987! Sega's great RPG series, that has been around as long as Dragon Quest and Final Fantasy. Over the years, the series has been in the hands of several of Sega's development studios (in chronological order: Sega RD4, Sega AM7 (Overworks/Sega Wow), and Sega AM8 (Sonic Team)). The original tetralogy of the series takes place primarily in the Algol solar system, consisting of the planets Palma, Motavia, and Dezoris (and one more), which are menaced by an evil entity known as Dark Force. ... Too bad that nobody outside Japan got to see any of these games. A number of times, the games of the tetralogy have been ported to newer consoles. At one point, there was even a Remake of the first two games in the tetralogy--Phantasy Star Generation 1 and Generation 2--for the Playstation 2. On top of a more fleshed out story (far more in Generation 1's case) and updated graphics, there were a few additional quests and tweaks made to the remakes. Of course, nobody outside Japan got to see these either. A similar remake of 4 was planed and a US release bundling the 3 was announced, but the remake of 4 disappeared and the US release along with it. Sega's continued to make games in the Phantasy Star series, but they've largely taken place in entirely new settings with only tenuous connections to the Algo System ... well, apart from the fact that Dark Force just can't seem to leave the universe alone. 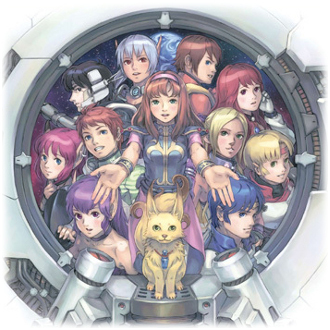 For more information on the sub-series that came after the tetralogy, see Phantasy Star Online, Phantasy Star Universe, and Phantasy Star Zero. As of 3rd of May of 2012, the original versions of Phantasy Star 2, 3 and 4 for Sega Genesis can be purchased and played on PC via Steam. Please add any examples relating to the Phantasy Star Online, Phantasy Star Universe, or Phantasy Star Zero sub-series to their dedicated pages. Action Girl: From Alis in the first game, to Nei, Rika, and Alys in the sequels. Algo Is The Center Of The Universe: Thoroughly justified in PSIV, as it's revealed that the entire star system and all that live in it were originally created by the Great Light to imprison the Profound Darkness. Anyone Can Die: This series is not even slightly shy about killing off its main characters. PSIV's Wham! Episode had Alys dying from the effects of the Black Wave. PSIII never killed anyone in the active party, but was absolutely murderous to the heroes of the first and second generations. And then there was PSII. Art Evolution: PSII, the Gaiden Games, and PSIV opted for a cell-drawn art style for cutscenes that was evocative of late Eighties and early Nineties anime. PSI and PSIII have a different (but still Animesque) style. Generation 1 and 2 sport their own cel-shaded style as well, distinct from the original PSII and PSIV. Artificial Human: The Numans: Neifirst, Nei, Rika. The android/cyborgs of III and IV probably count as well. And then there's Seth in PSIV. Awesome McCoolname / Fail O'Suckyname: The Japanese versions have some seriously WTH-worthy choices for character names. For just a small sampling throughout the series: Rolf was "Eusis", Rhys was "Kein Sa Riik", Crys was "Noin", and Kyra was "Shess". Can't Drop the Hero: Rolf. PSI and PSIII don't have enough characters per party to use this trope, while IV selects your party for you up until the end, and then, you only get to choose one Optional Party Member to take along with the four required ones. Compilation Rerelease: No shortage of these. The Sega Saturn and PlayStation 2 both offered collections which combined all four original games into one package; the Game Boy Advance offered one which combined the first three. Con Lang: Techniques from PSII onwards. The base spells (such as "Foie" or "Resta") are augmented with prefixes, with "Gi" and "Na" strengthening them and "Sa" making them target multiple subjects. This is much less obvious in the English translations with their five-letter limit. Cut and Paste Translation: In this case, overlaps with Pragmatic Adaptation and Macekre. Due to differences in language, a name in Japanese that easily fit in a short space can't when translated to a Western alphabet... and due to the hardware limitations of the era, simply making more room for "proper" English wasn't in the cards. As a result, localization teams often had to make new names for characters and items, but they often went out of their way to change the names into something entirely different--even for names that didn't need to be changed. They weren't consistent about the replacement names used, either. Cute Monster Girl: Nei and Rika, Numans in general. Darker and Edgier: Compared to the Final Fantasy games of the period, the series was far darker and far less willing to pull its punches. The first game started out with the heroine's brother being casually murdered by government agents, and the second through the fourth established that not only can anyone die, but that important characters will die and that your actions and failures will have consequences even if you succeed. It took until Final Fantasy Tactics for Final Fantasy to get this dark. Dead Character Walking: Can be done in the second Phantasy Star game. First, kill off everyone except Shir, then enter a shop repeatedly until she steals something and leaves the party. You'll now be able to walk around with an all dead party, though the second you get into an encounter, you'll die immediately. Devil in Disguise: In Phantasy Star 4, you are accompanied for the span of one dungeon by an adventurer named Seth. While his name doesn't really say anything of what he really is, using the Talk command from the menu gives subtle hints, and his abilities (most, if not all of which were used in previous fights by Dark Force) are almost a dead give away if you are paying attention. "Seth" is also the name of the ancient Egyptian god of darkness. Dropped A Bridge On Her: Alys. And to a lesser extent, Nei. Dual-Wielding: Possible with every character, starting with PSII, and highly encouraged when it's not more effective to use a two-handed weapon. You can even dual-wield shields if you need to beef up a magic user's defense. Eldritch Abomination: Dark Force in all the games. The Profound Darkness in PSIV, even more so. Expy: There's a reason why Numans seem catgirlish; Nei was deliberately meant to carry on Myau's legacy. During development, she even had a musk cat's tail. Rika was originally meant to be Nei herself, as was said by Tohoru Yoshida in an interview; conflict within the staff compelled him to make subtle alterations to keep Rika in. In fact, the four main characters of PSIV are, in a sense, representative of the games of the tetralogy. Rune Walsh given his identity as the fifth generation Lutz represents PSI. Rika, originally meant to be Nei, represents PSII. Wren represents PSIII, as another android of the same model was part of the main cast in that game. Chaz himself represents PSIV. Fighting a Shadow: Dark Force's relationship to the Profound Darkness--especially true in PSIV. Lassic also has a "shadow" fought partway through his castle in PSI. Genre Shift: The jump from classic console RPG to MMO Action RPG between Phantasy Star IV and the later sub-series, as well as the sidestory text-based adventure games like Phantasy Star Adventure. Getting Crap Past the Radar: The monster that attacks Alis while staying at the Governor's Mansion in Motavia is called a "Saccabus" (or rather, a succubus). Global Currency: Meseta. One of the mainstay concepts of the series, even after the tetralogy. Hijacked by Ganon: Dark Force/Falz has a nasty habit of appearing in nigh every game in some way, shape or form. Hollywood Silencer: On a laser gun, no less. Hyperspace Arsenal: As with most RPGs' inventory systems. Lego Genetics: Numans are humanoids comprised of human, monster, and animal DNA. To top it off, the first Numan was created accidentally. Magic Knight: Alis, Rolf, Chaz, and every third-generation protagonist in PSIII. Master Computer: Mother Brain in PSII. She's got a "daughter" named Daughter in PSIV. The Medic: Amy and Raja are the best examples, and several PSIII characters can be turned into this with proper tech distribution. Nintendo Hard: All four games of the tetralogy, although PSII is the most punishing, even with Level Grinding. Ominous Floating Castle: Lassic/La Shiec's castle in PSI, Skyhaven and Lashute in PSIII. Plotline Death: Tiem and Nei in PSII. Alys in PSIV. Required Party Member: Nei insists on joining Rolf for the first third of PSII. In PSIV, there is even less options on who to take, as the party makeup is often entirely decided by the plot. Even prior to the final dungeon, four characters in the five-man party are required. Robot Girl: Mieu and Miun in PSIII, Demi in PSIV. Science Fantasy: The setting is more or less sci-fi, but magic is commonplace in PSI and continues to exist in the games set afterwards (though its role is mainly taken over by Techniques). Series Mascot: Rappies, little fat fluffy yellow birds. It wasn't until PSIV that they started to fill this role; it's more pronounced in the later games. They also appear in PSIII by the name "Chirper". Shout-Out: In PSII Text Adventures, Shir's quest involves stealing the Opa Opa, a famous treasure. Some of the books Chaz finds on bookshelves in PSIV also reference other Sega franchises, like Sonic the Hedgehog. Crystal Spires and Togas: Rykros. Ghibli Hills: Palma before its destruction, and Landen, Draconia, Elysium, and Terminus on the Alisa III... before you factor in their sci-fi elements, of course. Motavia in PSII, due to terraforming. Shifting Sand Land: Motavia started out as this, and is regressing back toward it after Mother Brain's destruction. Also Aridia on the Alisa III. Slippy-Slidey Ice World: Dezoris, along with Frigidia and briefly Aquatica until Rhys fixes it. Sorting Algorithm of Weapon Effectiveness: Cruelly subverted in PSII. Dezo sells Laconia Daggers for 18,400 meseta, and only Shir can equip them. You'd think they'd be her ultimate weapon... But it only boosts her damage by 4. That's even less than the Scalpel. Generation 2 plays it straight thankfully, they've been heavily buffed into being Shir's best weapon. Spell My Name with an "S": Localization teams lacked consistency with translations (see the Cut and Paste Translation example above); as an example, the name of the Algo System's planets have plenty of variations on their names (Palma/Parma/Palm/Parm, Motavia/Motabia/Mota, Dezoris/Dezolis/Dezo). Squishy Wizard: Noah in PSI; Hugh and Amy in PSII; Hahn, Rune and Raja in PSIV. Sticky Fingers: Shir, PSII's resident thief, has a chance of stealing something from every item, weapon, or armor store that the party walks into and taking it back to Rolf's home in Paseo. This includes any stores on Dezoris, which is extremely counter-productive given the circumstance. Allowing Shir to steal something from Motavia's Central Command station nets you a visiphone that allows you to save your game anywhere (through the use item command), but she has to be over level 10 to do it. Talking Animal: Myau, and all other musk cats. Trauma Inn: Averted in the first two games, where you actually visit hospitals to heal your characters and churches/clone labs to resurrect them. Underground Monkey: Like other console RPGs, the creatures and enemies found in the tetralogy have lots of cousins, many of them Palette Swaps. Unobtainium: Laconia, a specific mineral found in the Algo star system (typically on Dezoris) which is among the hardest known to man. Your party's best gear will typically include several pieces crafted from it. It should be noted that Laconia itself isn't rare, but the knowledge of how to refine it doesn't get spread around. In IV, several stores sell "Silver" weapons and armor, which one of the shop residents explains is Laconia, but a low-grade form of it because out of outdated processing techniques. Vicious Cycle: Dark Force is slated to arrive every millennium to destroy the world. Until A space station slams into Palma in PSII, destroying it, and thus weakening the seal, allowing not 1 but three separate versions of dark force to slip into their dimension during PSIV. When Trees Attack: The trees surrounding Garubrek Tower in PSIV are carnivorous. There's also a few biomonsters in PSII that appear to be trees, too. You Gotta Have Blue Hair: Probably the series with the most impossible hair colors ever. To this day, very few video games and even fewer anime use a color best described as "electric laser limeade" for hair even once, let alone five times. This page was last edited on 3 September 2014, at 14:16.